It’s not unusual to see high-flyers Bell & Ross take inspiration from the world of aviation. In fact, it’s almost expected. However, the latest addition to their “Horo” label does it with a far more “grounded” perspective. Finding its muse in the practical aesthetic of an airport runway. Following on from last year’s three-handed Horolum, the Parisian brand has taken the next logical step and added a chronograph, featuring all the utilitarian styling of the original that’s sure to please the tool watch crowd. 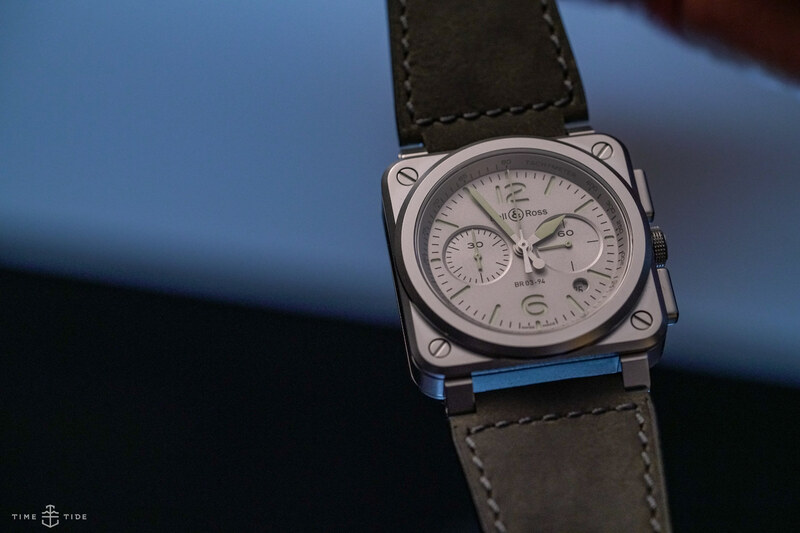 Beginning with the brand’s ever-popular BR-03 square case design, the BR 03-94 Horolum uses a 42mm microblasted steel case, with large rectangular pushers on its side to control the chronograph. By microblasting the case with a high-pressure spray of tiny glass beads, Bell & Ross were able to dull down the finish, creating a matt concrete-grey colouring that doesn’t reflect light, an effect that is also matched on its sandwich-style dial. That sees the hour markers of its top metal plate cut out to reveal a healthy dosing of lume – in step with all five hands of the Horolum – that has been applied below. Powering it from within is an ETA-based automatic chronograph movement, the Bell & Ross labelled calibre BR-CAL.301, with a power reserve of 42 hours. 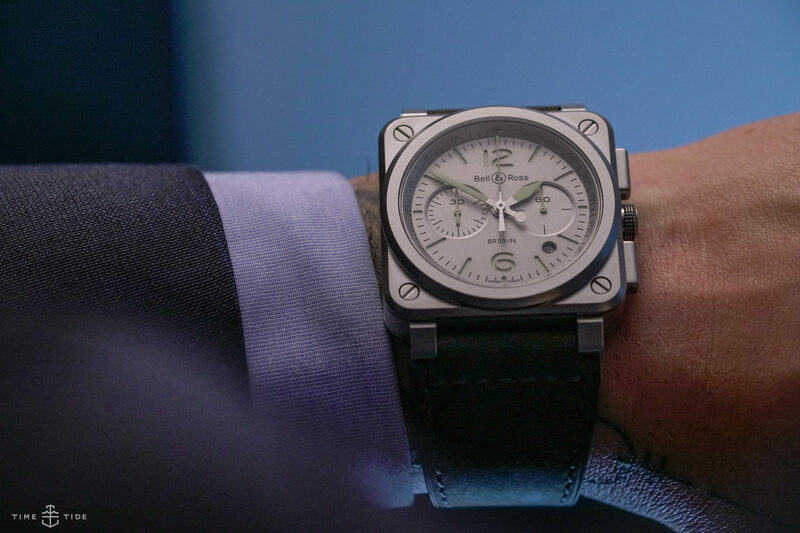 And to hold it to the wrist is a supple grey-green calfskin strap. 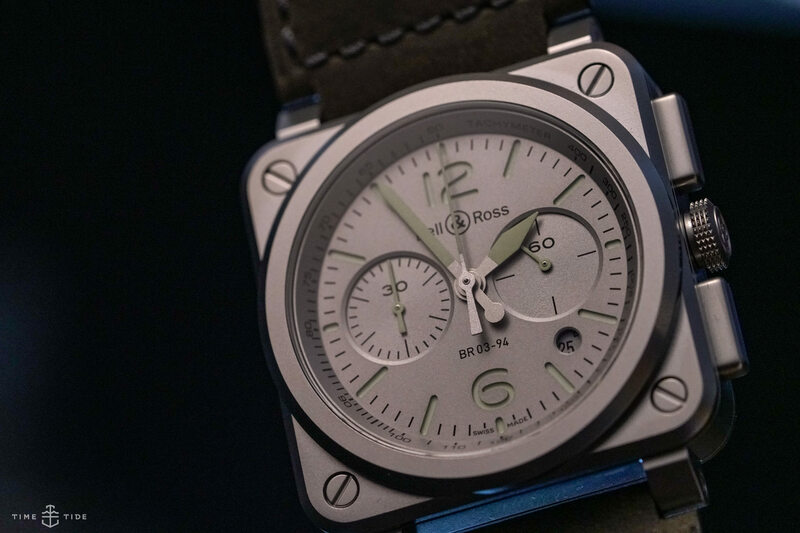 While this isn’t exactly a whole new watch for Bell & Ross — there’s already a number of chronographs in the BR-03 range that use the same bi-register layout — the newly styled anti-reflective finish of its case goes a long way in adding to its purposeful styling. While dial cut-outs for the hour markers add further depth and outstanding legibility, which is only made better when the lights go out and the runway lights come on. With good looks and practical styling, this is one that’s sure to be adored by lovers of tool watches. 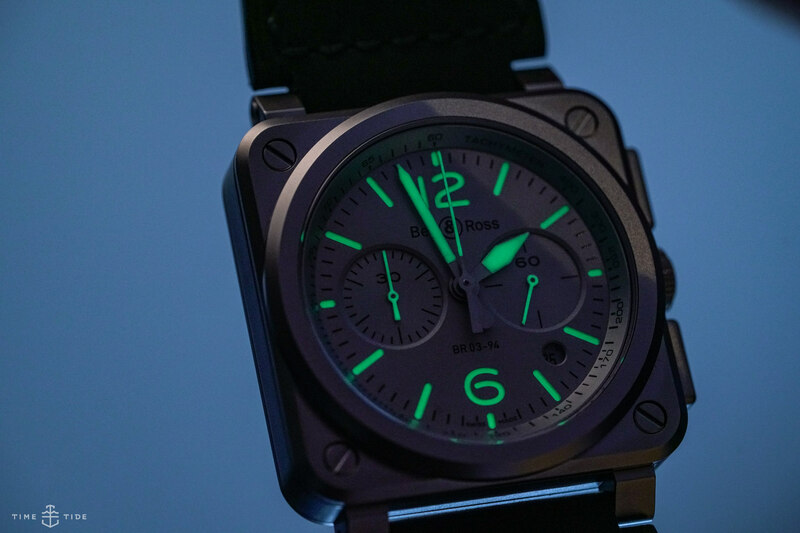 Especially if they also happen to be a fan of square cases, blinding lume, and flying at night.